Sound to good to be true? The fact is, it is not too good to be true, it is true. I just learn of this, and the good news is, this is not a cheat, but an official offer from MTN Nigeria, though it requires a little bit of sacrifice from your part. Here is what I mean. The 1GB for 200 naira data offer is only available to MTN subscribers who are returning to the network, that is, someone whose sim have been inactive in the MTN network but now chooses to reactivate it. Making a sim inactive is where the sacrifice comes in, because to make a sim inactive you have to stop making any chargeable actions with the sim for at least 30 days. What it means is, you are not to make a call, send an SMS or MMS, buy data or use your airtime to browse, nor subscribe to any value added service or do anything that will make MTN to charge your account for a least 30 days. when this is done, your sim's status on the MTN will change to inactive, and after you reactivate the sim by recharging or by making a chargeable action after the 30 days inactivity, MTN will automatically make your sim eligible to receive the 1GB for 200 naira data offer as part of their Welcome Back package to you. Note that the 1GB for 200 naira is part of the package and not the complete package, so if you were skeptical about if the 1GB for 200 naira is worth your sacrifice, you need to think again. 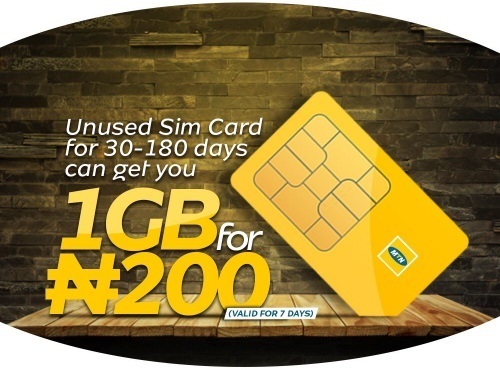 I will recommend you getting a pair of new MTN sims so that when you are enjoying these benefits in one as part of your Welcome Back to the network package, the other sim will be on it way to becoming inactive, so you will not suffer any break. This is because the Welcome Back package of each sim is not going to last forever. The validity period is for the first three (3) months after you have reactivated the inactive sim. If you are unsure as to whether your sim qualify or not, just dial *559*65# to check you eligibility status. If you are eligible, dial *131*65# to get started. So enjoy while it last. A fascinating Fact About Glo Data Rollover Service.